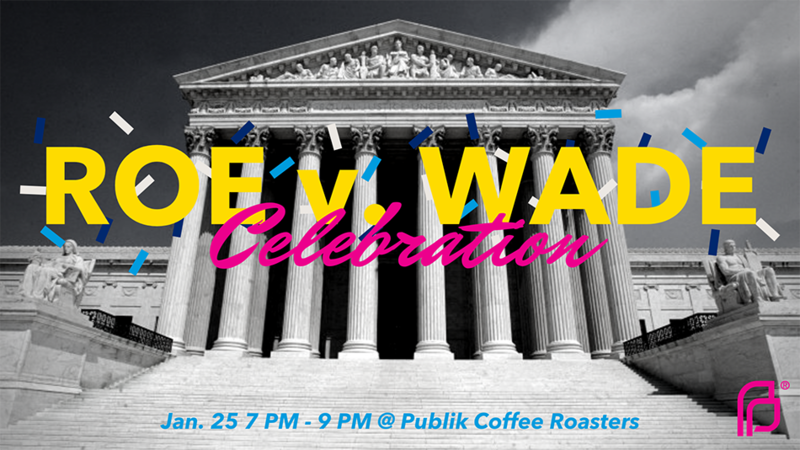 Join Planned Parenthood of Utah for a Curated Open Mic Night to celebrate the 46th Anniversary of Roe v. Wade – the landmark Supreme Court decision that protected a person’s right to safe and legal abortion in the United States. Performances from community members will include music, dance, poetry, spoken word, comedy, and storytelling all centered around the theme of Abortion is Health Care. Light appetizers from Laziz Kitchen included with ticket purchase. If you are interested in performing at the event, please fill out this form, and we will be in touch. All performances must be vetted. Tickets are now available. All proceeds benefit Planned Parenthood’s work providing comprehensive reproductive health care and education to Utahns, and advocating for policy that ensures that abortion remains a safe and legal option for Utahns. Public Coffee Roasters is accessible to wheelchairs and other mobility devices. An ADA section will be reserved near the front of the stage. ASL interpreters will be provided. Some content might not be appropriate for children under 16. Can’t make the event? There’s always time for a donation! Due to Planned Parenthood Action Council of Utah’s involvement in electoral politics, donations to Planned Parenthood Action Council of Utah events are not tax deductible. © 2018 Planned Parenthood Action Council of Utah. We’re the Planned Parenthood Action Council of Utah, a nonpartisan 501(c)(4) organization advocating for reproductive justice in Utah.